Dunder was only launched in March 2016 so it’s still a relative newcomer in the world of online casinos. Set up by a pair of experienced industry specialists from Sweden (Dunder means ‘wow’ or ‘boom’ in Swedish, incidentally), the company is based and licensed in Malta and is also licensed by the UK Gambling Commission, so punters certainly don’t need to worry about the brand’s reputability. The site is available in several languages, including English, German, Norwegian and Swedish. 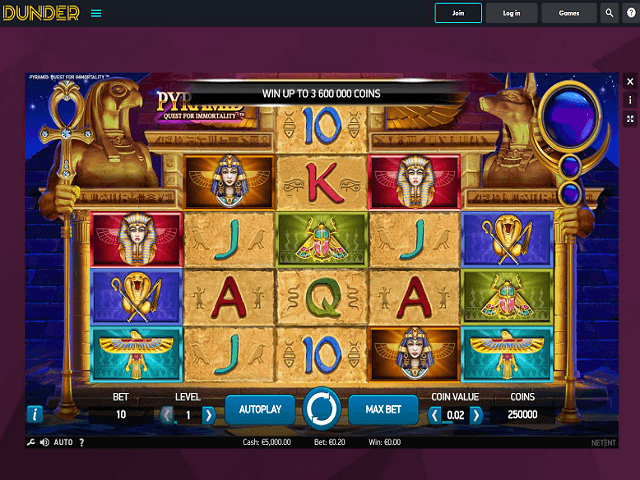 Dunder solely focuses on casino games, while also offering live casino and a mobile product. The largest portion of the game selection features online slots which heavily out-number all other game types, making Dunder Casino a prime slot sites for spinners to end up. Like most online casino operators, Dunder uses a range of providers for its large collection of games rather than limiting itself to one. With Quickspin, Microgaming, Play’n GO and NetEnt among its software partners, it can certainly claim to use the finest gaming providers around, ensuring that players get both a great use experience and a huge choice of titles. Dunder also uses Evolution Gaming for its live casino offering, as most sites do but the slot titles from their providers, in particular NetEnt, are what will blow most players away. Whether it's branded slots you like or original titles like NetEnt's wildly popular Gonzo's Quest slot - which was just recently adapted to become the first ever virtual reality slot - Dunder Casino has you covered thanks to its provider partnerships. Dunder emphasises simplicity in its mission statement and the website is certainly simple to navigate. The site is beautifully designed with a clean, simple layout on a white background without being too plain or boring. The games are spaced out with large thumbnails of each one making it easy to browse through, while the games are divided into categories. Generally the user experience is very smooth and there is little content on the website other than the games themselves, which is really all most visitors are interested in most of the time. The games are quick to load up and the graphics excellent. 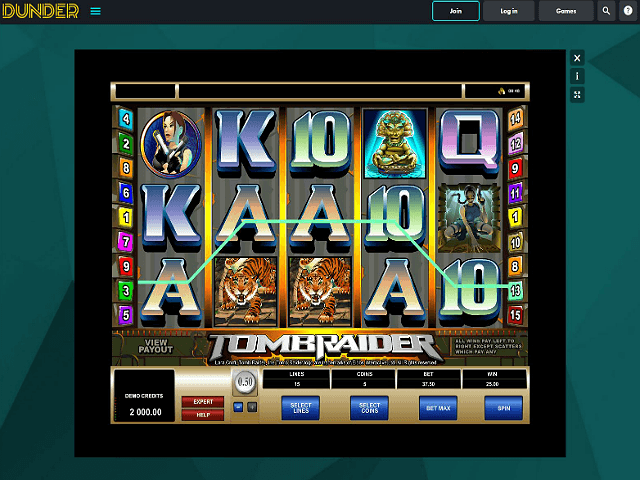 Dunder boasts a selection of over 1,000 games on its desktop site, with the majority of these being slot games. 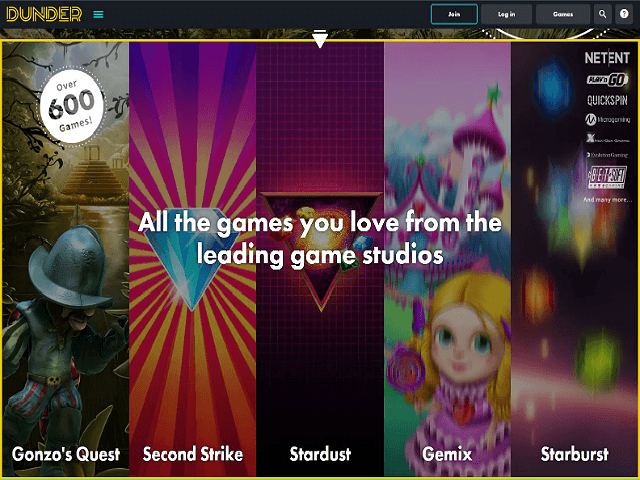 Since Dunder takes games from most of the leading software providers around, players can enjoy popular classics like Rainbow Riches, Secrets of Atlantis, Starburst and Gonzo’s Quest, as well as the hottest new titles like Quickspin’s Hot Sync and Joker Pro, the new one from NetEnt. New titles are added to the site regularly and can be found at the top of the menu. The way that Dunder categorises its games is quite unusual. Most websites just divide their games into broad categories such as slots, live casino, table games, jackpot and so on. In contrast, Dunder goes into very granular detail and splits slots into specific categories like fairy tales, high rollers, Christmas, wild reels, sports, retro and many others. Players can also filter games according to provider, or search for a specific title. Does Dunder Offer Progressive Jackpot Slots? 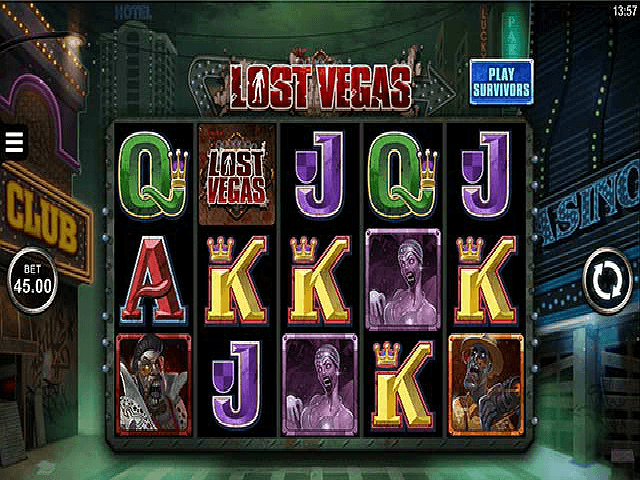 It certainly does; in fact, one of the many sub-categories of slots on the site is jackpots. There are over 20 to pick from, including the ever-popular Mega Moolah, with its minimum jackpot of €1 million, as well as titles such as Hall of Gods, Major Millions and Divine Fortune. With so many quality jackpot slots on offer, most players are surprised to find out this casino only launched relatively recently. Can Players Demo Dunder Slot Games for Free? Yes, the vast majority of slot games on Dunder can be played for free and without an account, so players can try before they buy. The only games that cannot be played for free are jackpots and live casino. Thanks the demo modes provided for each game, players at Dunder can get a feel for their top picks in terms of titles before wagering their hard-earned cash. Dunder offers players a variety of payment options. The site accepts Visa and MasterCard products, although there is a fee of 2.5% for these transactions which is considered a rare practice for online casinos when it comes to popular credit and debit cards. Players can also deposit using a number of e-wallet services like Trustly, Skrill, NETELLER and Euteller, although there’s a fee for the latter which is actually the norm. There’s a minimum deposit of €20 and maximum of €5,000 for all methods except Euteller and paysafecard, which have lower maximums. For withdrawing, the same methods and limits apply but unfortunately there is a €2.50 fee for all withdrawals, except those made via Trustly. Transaction times are instant except for card withdrawals, which take one to three working days. Overall, despite the somewhat unexpected fees, Dunder's payment options are considered on par with most competing slots sites. Like many casinos nowadays, Dunder gives new customers a tiered welcome bonus rather than just one bonus on their first deposit. First there are 20 free spins on Starburst just for signing up for an account. Then new customers can treble their first deposit of up to €50, plus they’ll get 180 free spins on Starburst and 20 spins every day for nine days. Dunder will then add 50% to their second deposit up to €150 and 25% on their third deposit up to €400. Overall it’s a pretty generous bonus package. Dunder uses SSL encryption on every single page of its website, which prevents anyone from being able to read sensitive information sent to the casino, including banking and registration data. With the company licensed by the UK Gambling Commission, visitors can rest assured that their data is safe and secure. As for customer support, Dunder offers a live chat function, which is open from 11am to 11pm CET. Outside these hours, it’s possible to leave a message and a member of the team will get in contact.